Both tech stalwarts have recently reported earnings; let's compare which of these blue chip stocks is more attractive at the moment. With the market as a whole relatively flat over the last year, shares of both IBM (NYSE:IBM) and Intel (NASDAQ:INTC) have struggled to keep pace with the major indexes. Both companies are currently weathering generational shifts in their respective businesses. For Intel, the semiconductor stalwart badly missed the rise of the mobile processor, while IBM reacted slowly to the rise of cloud computing. Considering both firm continues to play catchup with their respective industries' overall evolution, a highly justifiable debate is currently unfolding, asking if both companies are value stocks or value traps today. Which is currently the better buy: Intel or IBM? The world's largest semiconductor company's earnings last week was a mixed bag. Its reported revenue of $13.8 billion matched analysts' average expectations, and earnings per share of $0.54 were well ahead of the $0.47 expected by Wall Street. At the same time, Intel reduced its full-year guidance slightly, saying it expected sales to grow in the "mid-single digits," slightly softer than its prior forecast of growth in the "mid-to-high single digits." Intel also announced layoffs that will affect roughly 11% of the company's workforce, totaling some 12,000 jobs. Implementation is expected to last through 2017, and Intel believes the efforts will reduce its expenses by $750 million in 2016, and $1.4 billion annually from 2017 onward. Overall, the company's transition continues from its profit-printing PC-dependent semiconductor business to one more diversified around growth businesses including data centers, and increasingly, mobile devices. Though the company has considerable room to improve its business, especially in mobile processors, 40% of Intel's sales, and 60% of its profits, now come from non-PC business lines. 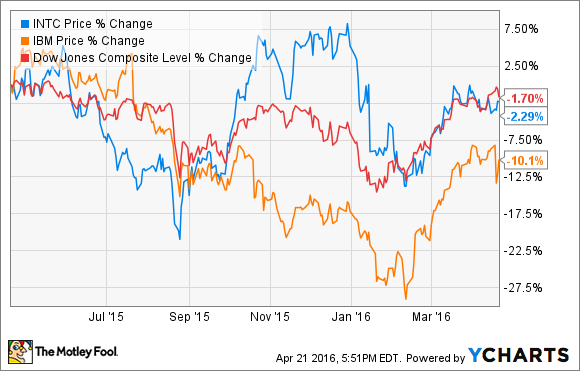 While Intel's recent earnings carried a mix of good and bad, the same can't be said for IBM. As much as I hate to say it, IBM's results were pretty ugly across the board. After seeing its sales contract 5% in Q1, IBM's streak of consecutive year-over-year revenue declines has reached the four-year mark. Sales declined across all five of the company's reporting segments, with gross margins contracting slightly in four of its five divisions. Non-GAAP earnings per share fell 19% versus the same quarter last year. It wasn't all doom and gloom, though; just mostly. IBM saw continued growth in what the company has dubbed its "Strategic Imperatives" businesses, which include platforms for cloud computing, big data analytics, mobile, and security. All told, these businesses, which IBM hopes will form the bedrock for the next generation of its operations, grew 17% on a constant-currency basis. However, this next generation of IBM's financial drivers has only accounted for 37% of the company's total sales during the past 12 months. So while this progress is much needed, it remains a far cry from being large enough to fully support IBM's current cost structure. Here's where things get slightly interesting. Though facing plenty of issues in mobile, Intel likely edges out IBM in terms of the current strategic positioning of its business pivot. Neither company could be said to enjoy the enviable industrywide dominance of their yesteryears, but Intel appears farther along than IBM in bridging the gap between its industry's present and future. Otherwise, IBM and Intel look eerily similar on paper. Both are mature technology companies that count themselves among the blue chip, old boys club that is the Dow Jones Industrial Average. Speaking to their currently precarious business conditions, both IBM and Intel trade at rock-bottom earnings multiples and high dividend yields. If you didn't know any better, you could easily mistake one's stock sheet for the other's. What's more, both companies have proven to be steady dividend stocks for tech investors interested in adding safe, income-generating assets to their portfolios. At the end of the day, Intel's current earnings paint the company in a reasonably better position than IBM. However, looking beyond the quarter-to-quarter noise, both companies are attempting to pivot their business models after badly missing the recent secular shifts in semiconductors and enterprise IT. Both companies have their strengths (valuation) and weaknesses (future uncertainty), and investors considering adding them to their portfolios absolutely need to weigh these countervailing factors before investing in either name.